…to begin with the notion of Sacrament in general, and then to descend to particular Sacraments which we call Baptism and the Lord’s Supper, in their order. But the Field is large, and the compass great, and therefore let’s begin where the Lords Supper itself began and that is at the Passover, at His death, and out of it’s ashes, this Sacrament of ours like another Phoenix did arise. For our Lord at his last Passover, his dying Passover, did institute and ordain this, that Lords Supper was to live and remain till he come again. Scaliger and others have observed, the very materials of our Sacramental Supper were taken out of the Paschal Supper:, for that very Bread which the Master of the Family used by custom to bless and give to the fraternity of Christians, saying, “This is the bread of affliction which the Fathers did eat in Egypt,” and that Cup which he blessed and gave to them to drink, called the Cup of the Hymn, or “Cos hallel,” because the Hymn followed after and closed all That Bread, and that Cup. So did Christ according to the rite severally bless and give, saying, “This is my body, This Cup is the New Testament in my blood”, and so he put new Superscription or signification upon the old Metal. And let all blind and bold Expositors know, that if they don’t expound on the many phrases and things mentioned in the New Testament, and do so from out of the old Records of the Jewish writings and their customs, then they shall be but saying their fancies, and not expounding upon the Text. Further, this fact may be confirmed by the many contextual arguments that abound. In handling of the Sacrament of the Lord’s Supper, I shall select such practical and preparative-Doctrine, as is necessary for your knowledge, that ye may discern the Lords body, and not be guilty of if, and for your practice, that you may examine yourselves, and not eat and drink unworthily. For if I should launch out into Controversies there would be no end. There hath been more paper written upon those six syllables, but five in English, “This is my Body,” than would be contain in a just and large Commentary upon the whole Bible. 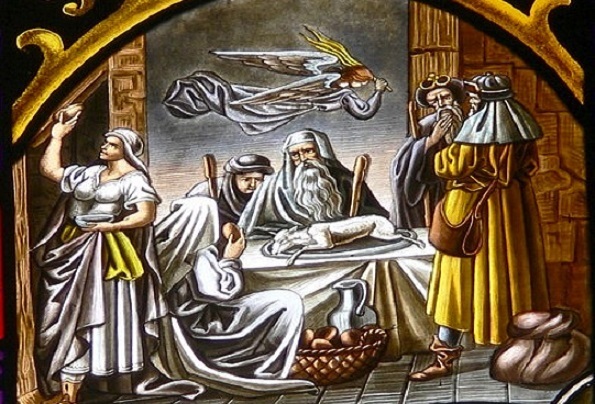 I begin with the Passover, which was the second (for Circumcision was the first) ordinary standing Sacrament of the Jewish Church, beginning at their going forth out of Egypt, and continuing till the death of Christ, when the Lords Supper did commence or begin, and so displaced it. The Passover signified what should become the Lords Supper. For what is fulfilled in Christ in the Passover were represented the Sufferings and Death of Christ by Lamb slain roasted with fire, in the Supper by bread broken, and wine poured forth. The outward symbols or signs differ but in reality, Christ is the same under both. Also, as Circumcision their outward symbol or sign, Baptism is ours. True, they are both different signs and rites, but in inwardly, Circumcision and Regeneration were both to be one. Theirs were a bloody Sacrament, for the Blood of Christ was to be shed; but ours unbloody, for the blood is shed. And our English well translates the word Passover, the Greek and Latin keep the word Pascha, which gave some occasion to derive it from a Greek word meaning to suffer, which is a mistake. The word is Pesach, from Pasach, which is to leap, or pass over. For when Israel after long servitude in Egypt was on wing to be gone, God commanded them in their several Families to kill a Lamb or Kid, and to roast it whole, and to eat it within doors that night, to sprinkle the side and upper door-posts with the blood, not the threshold. For Christ’s Blood must not be trampled on, and in so sprinkling the side and upper door-posts they should be safe from the destroying Angel, that rode circuit that night to kill all Egyptians first-born, but he passed over all the houses of Israel sprinkled with blood, and hence the name Passover, the Etymon that is given by God himself, Exodus 12:27. We have the kernel in this shell, the marrow of this bone, we have a Passover as well as they, but ours is Christ, our Passover is Christ, by our faith in the Word of God. We proceed; Our Passover is Christ, who was sacrificed for us. Our Passover Christ was true Sacrifice but whether their Passover was the Sacrifice or no, it is in question’. The Papists swallow it greedily, hoping thereby to prove our Supper to be both Sacrifice, and Sacrament, as their Passover (they say) was but there are others, both Lutheran and Calvinist, as Gerard, in Harmon, and Rivet on Exodus 2. They do not yield the Passover as a proper Sacrifice, though it be so called, Exod. 12:27. For they find in Egypt at the first Passover that there was no Priest, but the head of the Family. They also note that there is no Altar, no offering of the Lamb to God, no expiation. Nor is it necessary that it should be Sacrifice, for as a Type, there is the Sacrifice for the Serpent on the Pole which signifies Christ crucified and so the Passover as Sacrament may figure out Sacrifice, as our Supper is the commemoration of Sacrifice, but not a Sacrifice. On the other hand, Calvin and others, including Jewish Writers, hold it to be Sacrifice and a Sacrament for the Scripture calls it Sacrifice, and this blood was shed at first by the Pater-familias, they were the Priest, as no other priests were yet consecrated. However, the Priests or Levites were consecrated in after times, and the blood brought to the Altar, as if it was blood shed as a preservative from destroying Angels and therefore proper Sacrifice. What shall I say? I promised you not to puzzle you with Controversies and Disputes for I would rather set meat before you, which you may truly eat, than hard bones to gnaw upon. The truth is, Sacrifice is something offered up to God by men. Sacrament is offered and given to man by God, to be eaten or used in his Name and so, that part of the offering which is offered up to God, may be called Sacrifice, and that part eaten or used by man, a Sacrament: the very body and blood of Christ was a Sacrifice, not a Sacrament. The bread and wine as used are Sacrament, not Sacrifice. The Passover was the figure of true Sacrifice, Christ; and we may call it so, because the Scripture does. It follows; “Ye shall find that after the Passover-Lamb was eaten, the next day began the Feast, Numb. 28. 6, 17, and the Passover is called Feast too, Exodus 12:15, etc. and that continued seven days, kept in great festivity and solemnity but with unleavened bread. The Apostle alludes hereunto, “Our Passover is sacrificed, therefore let us henceforth…” We that have received the sprinkling of blood and eaten his flesh by faith, live all our days in holy rejoicing and thanksgiving, which is continual Feast and let us cast out the incestuous Corinthian out of our Society, for he is leaven, 1 Cor. 5:6, 7. “…and let us purge out of ourselves, malice, wickedness, etc. …for they are leaven,” verse 8, “that we may be holy Congregation, and holy People.” And so the argument of the Apostle stands thus, from the example of the Old Passover Those for whom Christ the Passover is sacrificed, ought as a holy Congregation and holy People to be unleavened with sin and wickedness, and to walk before God in an unleavened sincerity but for us, Christ the Passover is sacrificed. Therefore let us keep the Feast, etc. 1. As Sacrifice or figure of Sacrifice, and so it refers to Christ our Passover, Christ is sacrificed for us. 2. As Sacrament, and so it relates to us, and shows us our duty upon that Sacrifice: Let keep the Feast. Our Passover is Christ sacrificed for us. We have Passover but it is Christ sacrificed: And here before show the Analogy or resemblance between the Passover and Christ, we shall note three or four things. 1. They in the Old Church of Israel had Christ as well (though not so clear) as we, 1 Cor. 10:4. The Rock that followed our Fathers in the Wilderness, was Christ, the Passover was Christ, the personal Types, such as Isaac on the Wood, the real types, as their bloody Sacrifices, were Christ He was then in his swaddling clothes, swathed up in shadows and types, and not naked, as now, Gal. 3:1. Those Types being anatomized, and un-emboweled, are full of Gospel, full of Christ. The death of Christ is thought faith. Christ is the marrow in the bone, the kernel in the shell, yesterday and today, and the same forever, the sum and sweetness of all the Ordinances: Therefore though they say that the types were filled with temporal promises, but had no spiritual significance, derogate too much from them, as if they were Swine swilled with husks, and speak wondrous paradox. It is impossible for us to think that those that have had so much faith, as mentioned in Heb. 11, should have no Christ! For when we meet them in scripture, we give them the right hand of fellowship. And when we think about them they are the elder brother, and we give them a double portion of our attention. 2. Mark the form of speech, Christ our Passover, that is, our Paschal Lamb, which is also called the Passover, Exod. 12.21. Now the Passover properly was the Angels passing over the Israelite’s houses, and not the Lamb but we must learn to understand sacramental phrases, the sign called the thing signified, the figure called the thing figured, The Rock was Christ, Christ our Passover, that is, Paschal Lamb, Circumcision called the Covenant, Gen. 17:13. My Covenant shall be in your flesh. This will be allowed in every place but one, and that is this one, This is my body. For the Lutheran stands up for corporal presence under the Signs, the Papists for change of the Bread and Wine into Christ’s body and blood. No conferences, no disputes, no condescensions will satisfy them and yet we say very fairly, The very body of Christ born of the Virgin, that died on the Cross, that sits in Heaven, is present in this Sacrament but not in the Bread or Wine, but to the faithful Receiver, not in the Elements, but to the Communicants but all this will not serve turn. These two Prepositions, Con-substantiation and Tran-substantiation have bred more wars, cost more blood since they were born (and there is neither of them in this cause six hundred years old) than can be well imagined. 3. The Passover figured Christ, and yet the Jews ordinarily saw not Christ in it. It is plain in their celebration of the Passover, or their Rituals, they take notice of, and commemorate their Egyptian slavery, and their deliverance, and so they were commanded but of Christ not syllable. It entered not into them that Lamb roasted should figure the Messiah, as they had formed him in their thoughts and so they held the Passover, as type looking backward, but not as Type looking forward. They had no knowledge, except that some of the faithful had some glimpse of it. And this is the great fault of men in all Sacraments, they mind not the inward meaning of Sacrament, nor look for the kernel, for they did not discerning the Lords body. Is this not what makes us guilty of his body and blood? There is in all Sacraments an earthly and a spiritual aspect. Earthly men see the earthly part, they eat, they drink, but it feeds them not. The inward spiritual part is Christ. Set spiritual food before our bodies, and set corporal before the soul, and you elude both. 4. The Passover is Christ sacrificed; not Christ Lamb unspotted, but Christ the Lamb roasted with fire, and this tells you that the Passover and our Supper represents Christ crucified, Christ dying or dead. It is the death of Christ, not his Resurrection, nor his ascension, that is here set forth; “to show the Lords death till he come”, this is the sight which sinful soul would see this is the comfortable spectacle, to see the price paying, the ransom laying down, the thing in doing hence he draws the hope and comfort of Redemption, and therefore the bread was broken, and the Cup was full of blood, to represent to the life of this life-giving Death of Christ. The Papists have cheated the people of the blood by trick of concomitancy, telling them that the “bread is his body, and his body hath blood in it. We have words of scripture that the life is the representation of the blood that was shed, the Passover is the Lamb slain and roasted, and the blood on the door-post. And if by providence, the Papists will allow all to eat, then we have the cup, Mat. 26. 27. Drink ye all of it. So that it is the Death of Christ here represented, and if we look one step further, it is His Sacrifice-death, which works and makes atonement. And this is how it is with all the Sacrifices that the Passover did prefigure, for it is the Sacrifice-death that should deliver and make expiation…. This Cup (which by faith represents Christ) is the New Testament in my bloods which is shed for you and many, for remission of sins; death, and such kind of death as in our Sacrament is set forth as a Sacrifice-death therefore it is said to be sacrificed for us.